Translational Medicine: Tools and Techniques provides a standardized path from basic research to the clinic and brings together various policy and practice issues to simplify the broad interdisciplinary field. 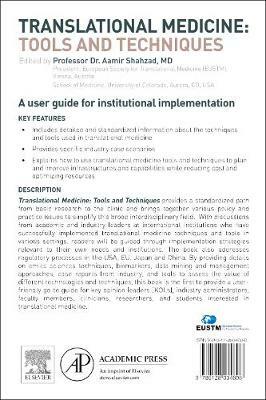 With discussions from academic and industry leaders at international institutions who have successfully implemented translational medicine techniques and tools in various settings, readers will be guided through implementation strategies relevant to their own needs and institutions. The book also addresses regulatory processes in USA, EU, Japan and China. By providing details on omics sciences techniques, biomarkers, data mining and management approaches, case reports from industry, and tools to assess the value of different technologies and techniques, this book is the first to provide a user-friendly go-to guide for key opinion leaders (KOLs), industry administrators, faculty members, clinicians, researchers, and students interested in translational medicine.